In the world of sports, the first Saturday in May is the biggest day for derby in the world. Thousands of spectators from all walks of life descend to one place to watch top athletes with clever names race around an oval track, showcasing their athleticism, strategy, and speed. The event takes place all day, but the only meaningful action takes place two minutes at a time. No, it’s not that derby. 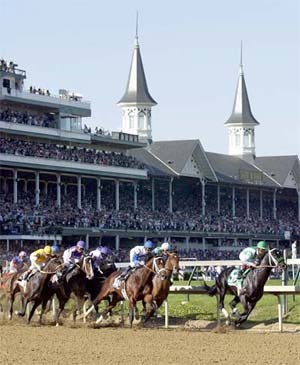 The Kentucky Derby, or “Run for the Roses” has been a derby staple since 1875. Okay, maybe comparing the two sports is a bit of a stretch. Still, the word “derby” isn’t in the exclusive domain of our beloved roller derby. It’s one that’s used regularly in the sports world. Here, I’ll highlight other “derbies” and attempt to compare them to roller derby. Notable: Inspiring the event as it is known today, “Home Run Derby” was a syndicated television show in 1960, where baseball players competed one-on-one hitting home runs for cash prizes. The 2008 Home Run Derby took place in Yankee Stadium in New York. Not much needs to be said about the home run derby, an American sports classic. Simply, it’s a contest between top home-run hitters in Major League Baseball to see who can hit the most balls out of the park. This event is so popular with players and fans, some in the sports world argue that the derby is bigger than the all-star game that it precedes. The home run derby brings out a lot of the culture and family aspect of the game. Many all-stars will watch from the field, with their kids in one arm and a video camera in the other, enjoying the moment. Players enjoy the moment and have a good time throughout, just like the skaters playing roller derby. Although professional baseball is serious business, it’s also what many ballplayers live for. There are lots of parallels between a baseball player’s passion for baseball, and a skater’s passion for roller derby. Notable: Soap box racing got its start in the 1930s, around the same time roller derby was invented. This year will mark the 74th running of the All-American Soap Box Derby. Does anyone have a soapbox anymore? Not that it matters. What used to be a blast down a steep hill on a box with wheels is now an American tradition with the youth of America, even though the steep hill part is still in there. Soap box derby in the modern age involves kids and parents working together to build a sleek and aerodynamic gravity-powered car. These cars are then parked at the top of a hill, loaded with an adventurous child, and released to its own fate. First one to the bottom wins. Soap box racing is a parent-child bonding activity, and much like the numerous junior roller derby leagues sprouting up across the country, is designed to keep young people occupied in meaningful and learning activities. I’m not sure what soap box racing would teach you, however—perhaps it’s the lesson on the importance of brakes. Notable: Every once in a while, a local race track will hold a demolition roller derby in an attempt to emulate roller derby, with but with cars and more crashing. Make sure you don’t park in the wrong parking lot. It is said that the first automobile race was held after the second car was made. 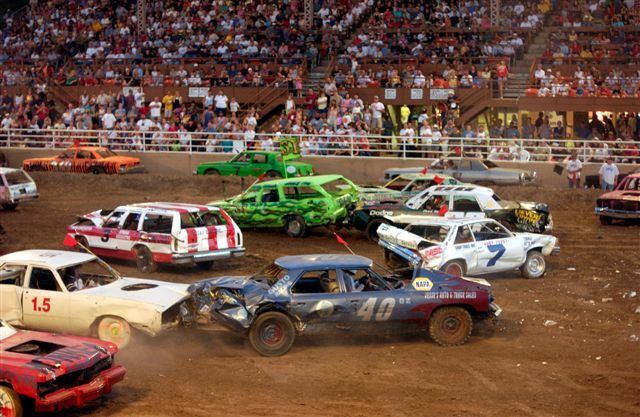 The first demolition derby, on the other hand, probably happened sometime in the 1950s. I’m sure it was discovered by accident. 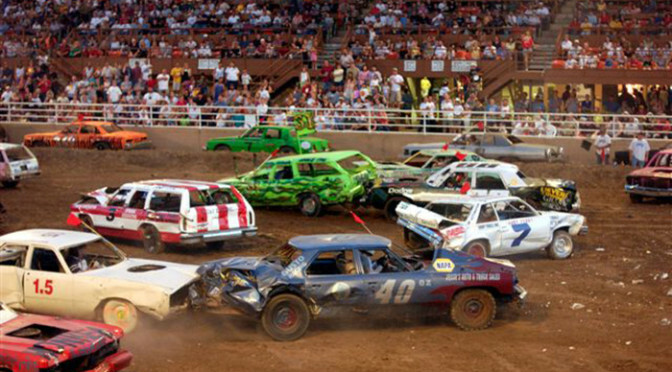 Demolition derby is strictly a local affair, with short tracks and dirt tracks holding events to appease the throngs of county patrons who just want to see violence and destruction. Participants take the time to pretty up their cars for the show, despite knowing there won’t be much of their car left afterwards. While it may seem like a pretty mindless thing, there’s a strategy game involved with crashing cars into each other. Most drivers prefer to back in to other cars, in order to protect their fragile radiators at the front. Once they go, so goes the car. Car positioning and being aware of other drivers around is a lot like how blockers in a roller derby pack need to keep their wits about them. Derby skaters won’t spontaneously burst into flames if hit in the wrong place, thankfully. When these two local teams get together, people throughout the entire world know about it. In sports, a derby (or local derby) is simply any game between two teams that are in very close proximity to each other geographically. This happens in American sports several times during the year, particularly in places like Los Angeles and New York that have multiple teams within the same league. However, we don’t refer to them as “derbies,” but rather a catchy name like the Subway Series or the Freeway Face-Off. If you skip across the pond, though, when someone mentions a derby, they’re thinking more along the lines of a fierce rivalry between local sports teams, particularly soccer teams. Football clubs in Europe are practically on top of each other, so derby games are very common events looked forward to throughout communities. They’re kind of a big deal. Unfortunately, soccer fans can sometimes get a little too passionate. Not a year goes by with reports of hooliganism—the act of acting or being violent in support for or in love with the sports team you support. Although rare, a derby can cause certain fans to go overboard with support, attacking supporters on the other team for no other reason that they are wearing the wrong jersey. In fact, this recently happened at a baseball game here in Los Angeles, where a San Francisco Giants fan was nearly killed by raucous Dodger fans. No one comes out a winner in situations like that, and we can only hope someday crap like that is weeded out from sports for good. 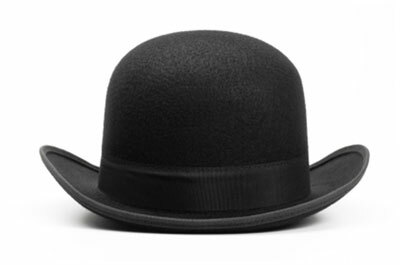 Notable: More commonly known as the bowler hat, this piece of headgear has been out of style for several decades. A shame, really. Look out roller derby: Here comes the derby hat. Roller derby has some serious style. So does the derby hat. Coincidence? Roller derby is starting to make a serious comeback. Surely, the derby hat won’t be far behind. You heard it here first. Previous PostPack No-Starts: An Analysis and CondemnationNext PostHistory in the Making?